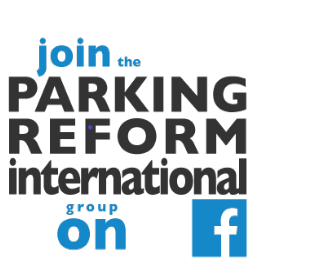 Is your city debating minimum parking requirements? Is abolition on the agenda? It should be! 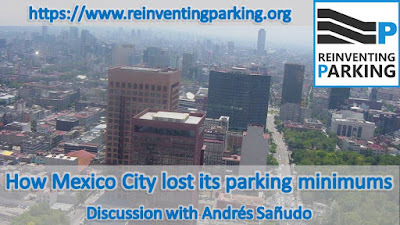 Episode 7 of the Reinventing Parking podcast focused on learning lessons from Mexico City, which abolished its parking minimums in July 2017. It replaced the minimums with maximums. This is not as drastic as it sounds, since the old minimums were set at excessive levels. Furthermore in the central area of the city, parking provided beyond 50% of the new maximums attracts a special fee. This aims to encourage developers to build less parking than the maximums allow and also to provide a source of revenue to improve alternatives to driving. READ the brief highlights below, and follow the links in the 'Learn More' section. LISTEN with the player above. There is a Youtube version (also embedded below). Get it as a podcast. Listen with your usual podcast player app and subscribe (it's free). Search for 'Reinventing Parking' in your podcast player app or you can click the symbol that looks like a wifi icon in the player above. [1:22] Andrés explained the fundamentals of the reforms that 1. abolished the minimums, 2. replaced them with maximums, and 3. imposed a fee to deter excessive provision of parking. [6:36] We discussed how the fee sends a powerful message: that off-street parking is not a way to mitigate on-street parking problems (as it is seen in conventional parking policy) but is actually a cause of problems that need to be mitigated! [8:10] How ITDP's careful and quantitative analysis of the off-street parking supply situation (which was published as "Less Parking, More City") was a crucial tool for the campaign. [12:25] ITDP Mexico didn't achieve all this on its own. We discussed the coalition that worked on the campaign. It included some surprising elements, such as forces inside the city government, real-estate developers, and a business competitiveness think tank, along with more familiar actors such as bicycle advocacy groups and other sustainable transport non-profits. Media outreach, training and awareness raising was also very important. [18:22] Who opposed the changes or wanted to water it down. Large retailers were prominent. Surprisingly, NIMBY resident groups were not a big part of this story. [20:00] The campaign's media and public outreach effort and why it was successful. "Just talk about it and keep talking about it!" [21:05] Some brief comments about on-street parking management in Mexico City. We will need another episode about this, some time. [22:30] We discussed early signs, anecdotal so far, that many developments are providing less parking than before. However, no formal evaluation has been conducted yet. It is early days. Read Andrés' 2014 Reinventing Parking blog posts on which explain key points from the document "Less Parking, More City": Mexico City's Required Parking Glut (part 1 and part 2). Get the ITDP document "Less Parking, More City", which was instrumental in the campaign. ITDP recently created an interesting Interactive Timeline that highlights the key events. In November 2017, ITDP held a webinar with Andrés Sañudo and Bernardo Baranda on How Mexico City Abolished Parking Minimums. You can watch the video here. Andrés Sañudo worked with ITDP Mexico from 2011 to 2015 where he coordinated their successful efforts to promote parking reform. He is now R&D Manager with REURBANO, a real-estate development company that, among other things, specializes in context-sensitive, walkable and parking-lite developments in historic areas. But Andrés hasn’t left civil society behind. He is a also now a key figure in CoRE Foro Urbano, which is a multi-disciplinary civic group that is pushing for a Mexico City that’s livable, lovable, and equitable. Please do recommend Reinventing Parking or SHARE this article and episode with any of your friends or colleagues who might be interested. Please share on social media too! subscribe to the audio podcast (search for 'Reinventing Parking' in your podcast player app or click the symbol that looks like a wifi icon in one of the players at the top or bottom of this article). You can also help me make time to continue this work by becoming a Patreon patron of my efforts. I would very much appreciate your feedback or comments below.